The original uncropped photograph rediscovered in September 2010. This is believed to be the oldest photo of an Australian Football team. To read the story behind this photograph, click onto "Football's Earliest Image Unearthed", highlighted in the box at the bottom of this page. In Mark Penning's book "Origins of Australian Football 1858-76" (p143) it says of this photo, "Dave Adamson, the captain, is likely holding the football and Jack Conway is 3rd. from the left in the front row of those lying on the ground." 2017 February 10, new information about this photo has been sourced from the Tasmanian State Library in Hobart. The short lived "The News" newspaper (Hobart) from October 1924 published a cropped version of this image. "The News" named 4 people, Ben James far left with hands on his waistcoat, Dave Adamson holding the ball, Jack Conway immediately to our left of Adamson, and Robert Robertson four along from Adamson on our right. "The News" said the image is from 1870. but Adamson's last season for Carlton was in 1868. He captained the team at Royal Park once for Carlton's game there which was the opening match of the season. "The News" has named Jack Conway although he is not named in the team squad perhaps he did play. Or, may be it is not at Royal Park? Dave Adamson did play on July 25 and August 01 at Royal Park but Jack Conway was named as captain for those matches. Generally the captain held the ball in a team photograph, but perhaps it may have been Adamson in one of theses later matches? It looks like there are 21 players plus 8 others/officials in the photo. The caption says 1870, but all other dates associated with this image mention 1868. The News have named Colonel Robertson/Robert Robertson. Although he was not named in the team squad, this would not have precluded him from playing if he was called on. Plus Emergencies; (4) Lambert, Bruford, Brown, Henderson. The Australasian May 23, had added (6) D'Arcy, Felstead, Kennedy, Webb, Gorman, & Power Tom Power to the team squad. December 15 1894 (p17) The Australasian's cricket writer "Felix" (occasional Carlton footballer Thomas Horan) reminisces about the Carlton Cricket Club and mentions that in the club rooms there are photos of Carlton's Cricket and Football teams. "In the pavilion I saw some old portraits of Carlton cricket and football teams which took me back in a bound to the sixties. One football team in especial brought back old times and old and well remembered faces. There is Jack Conway; captain of the Carlton, standing near the good old gum tree with a football in his hand; there are Harry Guy, Billy Williams, Joe Williams (is it the same old Joe who now keeps the refreshment-room in Clarendon-street, South Melbourne? ), Harry Bannister, Tom Power, Sharpe, Armytage, George Kennedy, Charlie Barrass, little Tom Reilly, Bob McFarland, M. Webb, and last but far from least the old warrior Ben James." Could this be the above photo? See October 08 for the details on this object. Carlton Captain. Dave Adamson, Jack Conway. Carlton did not suffer a defeat this season and scored 10 goals to 4 against. An illuminated address was presented to Francis (Frank) Hillsden as a measure of esteem. May 25 Monday, Carlton played Geelong at Royal Park. June 13, Carlton played a practice match at University Paddock 2.30pm. June 20, Carlton played South Yarra at South Yarra. July 04, Carlton played a nil all draw with Melbourne on a wet M.C.G. July 11, Carlton played a practice match at University Park at 2.30pm. 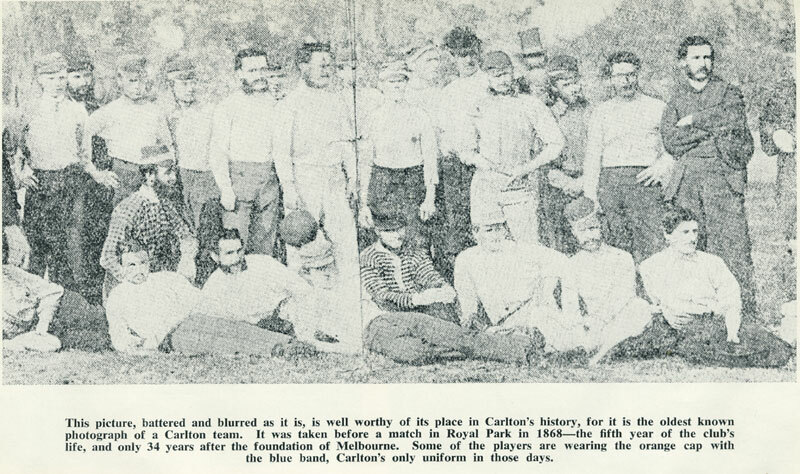 August 01, Carlton played H. M. 14th Regiment at Royal Park (1-1 draw). August 08, Carlton vs Emerald Hill match postponed; practice match instead. August 15, Carlton played Melbourne on the M.C.G. Nil all draw. August 22, Carlton played South Yarra at South Yarra. August 29, Carlton played a team comprised of members of the Pentridge and Collingwood clubs at Royal Park (Carlton 20 against combine's 30 men. September 05, Carlton played Geelong at Geelong. September 12, Carlton played a practice match at University Park. Melbourne, South Yarra and South Melbourne declined to play at Royal Park. The only clubs to meet Carlton there were University, Geelong and that of the 14th. Regiment. Defeated University 2-1, return game against Geelong 1-1 draw, 14th. Regiment 1-1 draw. This season after internal dissention at the club, James Byrne, Charles Forrester and Harry Chadwick crossed to the Melbourne Football Club. Carlton Football Club's fourth annual meeting at Polmer's Carlton Club Hotel, Cardigan Street Carlton, at 7.30pm. The finances of the club were in a satisfactory condition. Honorary secretary and treasurer; R. McFarland. Committee; Adamson, Guy, Charles Hillsden, Frank Hillsden, O'Brien, Owen. Before proceedings started, Harry Guy was presented with an illuminated address for his play last season, it was signed by every member. This address expressed the admiration of the club. The report and balance sheet was read by the secretary and adopted. It showed that the club was in a prosperous position, one match lost, two matches won, and three games being drawn. Financially, a small surplus remained with the treasurer. The Carlton Imps. was a separate club to the Carlton Football Club and its Second Twenty or Reserves. This season a Carlton Second Twenty (or Reserves), was formed. Carlton played a scratch match in Royal Park at 2.30pm. Carlton held a special meeting at Polmer's Hotel at 8pm to discuss what to with a five guinea trophy donated by a member of the committee. Carlton played a scratch match in the University park with sides selected by Hillsden and Duncan. A meeting of club secretaries at Nissen's Cafe at 8pm to arrange matches for this season. 'The Carlton next gain attention, and, from the show they made last season, bids fair to prove very formidable this. There are some really good players in the club, namely, Guy, Hillsden, Chadwick, &c.; and, from the exhibition on Saturday, their feet do not seem to, "have forgotten the kicking powers." Last season they were rather unfortunate, but this time I hope they will be a little luckier than has been their wont in great matches." Carlton played a scratch match at Royal Park between teams led by Hillsden and Duncan. Hillsden's team scored two goals. Teams selected by Adamson and Hillsden. Waugh kicked one goal for Adamson's team. The team to play Geelong was selected after the game. Melbourne played South Yarra on the Melbourne Football Ground. "It would be well if, in the prospect of a long football season, one or two trees, which much interfere with the game on the Melbourne ground, were removed. With the permission of the corporation this could be done by the club, with great advantage to the players, who are frequently in danger of life and limb, and the removal of these obstructions would not injure the appearance of the ground." Adamson, Armytage, Azzopard, Barfoot, Clarke, Duncan, Freeman,Goodall, Gorman, Guy, Hillsden, Hillsden, McCarthy, McFarland, Moody, O'Brien, Philips, Power, Waugh. Adamson, Armytage, Azzopardi, Barfoot, Brown, Bruford, Clarke, Duncan, Freeman, Goodall, W. Gorman, Guy, Henderson, C. Hillsden, F. Hillsden, Lambert, Moody, McCarthy, McFarland, O'Brien, Phillips, Power, Waugh, Williams. Match commenced about 1pm, and continued for four hours till dusk. Geelong claimed a goal early in the game that was disallowed. The Pivots felt hard done by and claimed the victory. Waugh scored the first goal, ends were then changed and Geelong equalised not long after the restart. D. Adamson (Capt. ), J. Armytage, Azzopard, Bannister, Barfoot, Clarke, Duncan, Freeman, Goodall, Guy, Charles Hillsden, Frank Hillsden, Moody, McCarthy, McFarland, O'Brien, W. Phillips, Waugh, J. Williams, W. Williams. Emergencies; Bruford, Brown, Henderson, Lambert. The Australasian May 23, had added D'Arcy, Felstead, Kennedy, Webb, Gorman, & Power to the team squad. Carlton played splendidly despite the hard game against Geelong on Monday. A fine exhibition of drop kicking was performed by Duncan, Kennedy, and Hillsden and some Melbourne players. "This practice of running with the ball should be avoided, as it entails a great deal of unnecessary "scruffing" and holding, not to mention frequent appeals etc." "A good deal of of unnecessary "catching around the neck and pulling down" took place during the day, but on the whole the match was played good humoredly and without the slightest accident of any kind." Guy, Goodall and McCarthy did not play. Crowd encroachment was a problem. Adamson (Capt. ), Armytage, Azzopardi, C. Hillsden, F. Hillsden, Guy, Clarke, Bannister, Barfoot, Bruford, Kennedy, McCarthy, McFarland, Waugh, Goodall, Wills, Barrass, Duncan, W. Williams, J. Williams, O'Brien, Lambert, Felstead, Power, and Henderson. Best; O'Brien, C. Hillsden, F. Hillsden, Azzopardi, J. Williams, W. Williams. The Age said; ".... as was anticipated, resulted in a well-contested game, without a goal being kicked by either side." D. Adamson (Capt. ), Azzoppard, Armytage, Barfoot, Bannister, Barrass, Conway, C. Hillsden, F. Hillsden, Kennedy, Guy, O'Brien, W. Williams, J. Williams, Goodall, Duncan, McCarthy, Waugh, Clarke, Ballantyne, Philips, Felstead, Robertson, McFarland, and Henderson. Players mentioned; Adamson, Guy, Adamson, Hillsden, Duncan, Conway. Carlton held a practice match at University Paddock at 2.30pm. North vs South on the Melbourne ground. Players for the two teams were selected on where they lived, either north or south of The Yarra. The report said a large crowd of 3,000 attended the match in the Richmond Paddock, but far too many goals were kicked! Adamson, Bruford, Duncan, Goodall, Guy, C. Hillsden, F. Hillsden, O'Brien, G. Waugh, J. Williams, W. Williams. The best contested match this season. Ground slippery, play lasted two hours and continued until dark. Adamson (Capt. ), Armytage, Azzoppard, Barrass, Barfoot, Bannister, Ballantyne, Conway, Clarke, Duncan, C. Hillsden, F. Hillsden, Guy, Goodall, Kennedy, Henderson, Markham, McCarthy, O'Brien, Philips, Robertson, J. Williams, W. Williams, Waugh. Carlton held a practice match at University Park 2.30pm. All members requested to attend, to enable the committee to select the teams for the next two Saturdays. Carlton played Emerald Hill at South Melbourne. Emerald Hill ground is on the western side of the railway. The local club ground has lately been changed, and the matches are now played on a good level sward a little distance from the station. The new ground is much superior to the old, but it has the disadvantage of being exposed to the sea-breeze, which is a great help to the team fortunate enough to kick with it. On Saturday this was particularly apparent, as the breeze was anything but "a gentle zephyr." Players met at the Town Hall Swanston Street at 2pm. The Hill won the toss and kicked with the aid of a stiff sea breeze. Carlton's kicking was better than the home team, but having to kick into the wind all day prevented the Blues from scoring. D. Adamson, H. Adamson, Armytage, Ballantyne, Bannister, Barfoot, Clarke, J. Conway (Capt), Duncan, Guy, Henderson, C. Hillsden, F. Hillsden, Kennedy, McFarland, O'Brien, Robertson, Waugh, J. Williams, W. Williams. Emerg; Azzopard, Wills, Parish, Goodall, Morkham/Markham. Players mentioned; (6) Guy, Conway, Williams, Clarke, C. Hillsden, F. Hillsden. Old scholars of Melbourne Grammar & Scotch College played on the Melbourne F. G.
Carlton played University at Royal Park at 2.30pm. University was disadvantaged having to play with 17, then 18 to the Blues' 20. "This game was played on the Carlton ground in Royal-park, on Saturday last week, and was noticeable for really scientific play. The students showed a first-class team (playing two short). It was chosen from members of various clubs who have been students of the University, and displayed some remarkably good names. The Carlton men lost the services of one or two of their best players, who were unavoidably absent. Armytage scored the first goal. D. Adamson, H. Adamson, Armytage, Azzoppard, H. Bannister, W. Barfoot, Ballantyne, Clarke, Conway (Capt. ), C. Hillsden, F. Hillsden, Guy, Goodall, Kennedy, Jones, Henderson, Markham, McFarland, Power, O'Brien, Robertson, J. Williams, W. Williams, Wills, Waugh. The Australasian had included Parish and Phillips in their 25 man squad. Carlton played H. M. 14th. Regiment at Royal Park. The British troops were back in Australia on R & R after fighting in the New Zealand Wars. Lt. Noyes led the British side. The Blues put a good show against the much heavier Regiment team. A dense fog put an end to the game at around 5pm. D. Adamson, H. Adamson, Armytage, Ballantyne, Bannister, Conway (Capt. ), Clarke, Duncan, Guy, Henderson, D. Jones, C. Hillsden, F. Hillsden, G. Kennedy, McFarland, O'Brien, R. Robertson, J. Williams, W. Williams, Waugh. Emergencies; Azzoppard, Goodall, Wills, Harrison, Parish. Came rushing along with a wild hurrah." The waves that thronged its stormy home." And there was many a moan and a wirra! ochone! As Fourteenth after Fourteenth lay o'erthrown." Carlton to play Emerald Hill. The club will meet for practice at 2.30pm at University Park. Carlton held a special meeting this evening, at Polmer's Carlton Club Hotel, Cardigan Street at 8pm, "respecting the disposal of a five guinea trophy," and to make arrangements for the return match against Geelong. One of the finest games seen on the Melbourne ground for long time. In an exciting game, with many spills and scrimmages, J. Ballantyne was carried from the ground, he was found to have been severely shaken. Melbourne have not been able to score a goal against Carlton this season. Conway (Capt. ), Adamson, C. Hillsden, F. Hillsden, Duncan, O'Brien, Clarke, Guy, Kennedy, Armytage, Waugh, W. Williams, J. Williams, Bannister, McFarland, Ballantyne, Barfoot, Philips, Robertson, Jones. Emergencies; Henderson, Azzoppard, H. Adamson, Morkham, Newing. The Age; "The Carlton Club visited the South Yarra ground last Saturday, and played the localists a pleasant game, which terminated in favor of Carlton, two goals being kicked by Mr. Kennedy. The South Yarra men were led by Mr. Wright, and the Carlton by Mr. Conway." The Australasian; "The match was pretty even for an hour or so, when Mr. Kennedy caught a "mark" for Carlton at some considerable distance from the South Yarra posts, but managed to drive the ball fairly through by a first-class kick, securing the first goal. The ball was not allowed long at rest, but was kicked off again at once, and forced down the field very quickly, the Carlton men kicking in fine style, and in a scrimmage close to the South Yarra posts Mr. Kennedy again got hold of the ball and kicked it neatly through, obtaining second goal within ten minutes of the first." Adamson, Azzoppard, Armytage, Bannister, Barfoot, Ballantyne, Clarke, Conway (Capt. ), Duncan, C. Hillsden, F. Hillsden, Henderson, Harrison, Kennedy, Jones, Gorman, Markham, McFarland, O'Brien, Phillips, Parish, Robertson, MacIntosh, Wills, J. Williams, W. Williams. Carlton (20) played a combine team (30) comprised of 15 players each from the Pentridge and Collingwood clubs, at Royal Park, 2.30pm. Pentridge and Collingwood were to play each other, but have arranged for this match to combine and play Carlton. After a close and exciting game and against the overwhemling odds Phillips managed to kick a goal. "There will be no match at football on Saturday between the Carlton and Geelong clubs, the secretary of the former having written down to say that business engagements interfere with the proposed arrangements, and the match has accordingly been indefinitely postponed. This has given great dissatisfaction to the members of the local club." "The Carlton Football Club have recalled their decision, and have agreed to bring a team to Geelong on Saturday next. This is as it should be, as arrangements have long been made for their reception." Players met at Spencer Street railway station at 11am. This game will be 16 per side, but if more players attend the side will be adjusted. The Argus said; "Mr. Conway, the captain of the Carlton team, had only had fifteen men, a substitute was found for him in the person of G. Synnot." Geelong had a player named Synott who played in their practice match in August. There was some confusion as to the result. The Carlton players had stopped playing while awaiting a decision by the umpire regarding a mark taken by a Carlton player, meanwhile a Geelong player kicked a goal. A letter to the Geelong Advertiser on the following Tuesday said that both the Argus and the Age had given the game as a draw when it should have been a Geelong victory. However, Monday's Argus said that Geelong had won - See Jack Conway's and Tom Wills' letters below. Adamson, Armytage, Azzopard, W. Barfoot, Bannister, Basil, Conway, Duncan, Green, Goodall, Guy, C. Hillsden, F. Hillsden, Jones, Kennedy, Newing, Power, Richardson, R. Robertson, Webb, W. Williams. In another section of this day's The Leader newspaper, these additional player's names are included in the Carlton team. Players mentioned; (10) Conway, Duncan, F. Hillsden, Kennedy, W. J. Williams, G. Synnot, Barfoot, Newing, Bannister, Robertson. Carlton held a practice session at University Park at 2.30pm. Mr. John Conway in the chair. The honorary secretary brought forward the report and balance sheet, which were unanimously adopted. The report showed the season to have been a highly successful one, the club never having sustained a defeat, and having kicked ten goals, whilst only four goals had been kicked against them. An interesting item in the proceedings was the presentation of an illuminated address from the members, conveying expressions of the esteem, to Mr. Francis Hillsden. The remaining business was merely of a formal character, the proceedings closing with a vote of thanks to the chairman. A letter to The Australasian. To the editor of The Australasian, - Sir, - Allow me through the medium of your columns, to contradict a report that has appeared, to the effect that the Carlton suffered defeat at the hands of Geelong. After each side had obtained a goal a curious dispute arose, the facts of which are as follow: - An appeal was made to the central umpire as to whether a catch was made by one of the Carlton men was a mark or not. The Geelong men, however, regardless of the appeal, knocked the ball out of Mr. William's hands, and rushing off, kicked a goal while we were awaiting the decision of the umpire, which could not be heard amid the yells and groans of the spectators, who became so uproarious that we had to beat a hasty retreat to an adjacent hotel. Mr. Bowden, the Geelong captain, shortly after waited on us, to know if we would come out and play the last goal over again. This we agreed to, and went out, when Mr. Bowden informed us that some of his men had gone home. Was not this in itself sufficient for us to believe that the game was a draw? During the time that elapsed between the appeal to the umpire and his answer the ball is dead, and consequently the umpire at the appeal end could have no jurisdiction. At any rate, I will leave it to the footballers in general and the discriminating public to decide as to whether the game is a "draw" or not. Apologising for trespassing on your space, I remain, &c., J. Conway, captain of Carlton Football Club. Sir, - I cannot allow the assertion made by the Carlton Football Club, through Mr. Conway, their captain, in your columns to go unchallenged; and not withstanding the assertion that the Carlton were not beaten, I maintain that, according to all rules adopted by football clubs, they were defeated. Of course it is perfectly open for any club to deny being beaten; but that assertion, although it may satisfy the vanity of the defeated, will not, nevertheless, stand against the fact that the victors did get two goals, and that quite fairly. Yours, &c., T. W. Wills. Geelong. Carlton Football Club meet this afternoon in the Royal-park at 2pm. "Referring to the past season's doings the matches between the Metropolitan and Carlton clubs stand pre-eminent, either as trials of skills or struggles for the mastery. 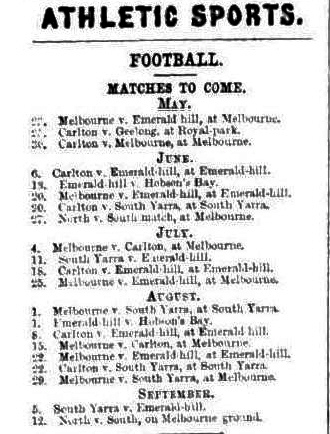 it is needless to refer particularly to either of these clubs, the position of both being so firmly established; the Carlton have just completed their fifth season, and the Metropolitan have been in existence almost since football was known as a sport here. Both can send out rare teams, each having received considerable additions since last season. Melbourne; in fact, now playing two or three men who were then enrolled under the Carlton banner, and the suburb having enlisted one or two veterans at the early part of the campaign. So even throughout have been the contests, that, although three spirited matches have been played, only one goal has been kicked, which was placed to the credit of Carlton in the first match of the season. "Before I conclude I wish too say a word on two subjects, viz, the disinclination of the various clubs to visit Royal-park, and the too prevalent practice of shirt-tearing. The park ground is undeniably the best ground in the colony, and is quite as easy of access as any of the other grounds, yet the Carlton men have not been able to induce Melbourne, South Yarra, or South Melbourne to come up to the park this season, and the only clubs that have visited it are the University, the 14th Regiment, and the Geelong. I hope next season that the various clubs will see the justice of returning the visits of the Carlton Club." "...for the purpose of presenting silver buckle belts given by a gentleman member of the club to each of the five members who had most distinguished themselves during the past season. These gentlemen were Messrs. Adamson, O'Brien, Guy, Duncan and Barfoot. The presentation was made by Mr. Geo. Owen, who occupied the chair, about twenty members being in attendance." The Carlton Football Club assembled at Nettleton's Photographic Studios in Madeline Street at 2pm. 1890 The Argus Sept. 22, writing about the early days of football, said of 1868 that Carlton were undoubtedly the best team. Another premiership the Blues can claim? Outstanding players for the Blues during the year were Harry Guy, Jack Conway, Frank Hillsden, Dave Adamson, Theophilis S. Marshall, Lanty O'Brien, Duncan, one of the Gormans, Kennedy and Williams. Following internal dissension in the Carlton club, James Byrne, Harry Chadwick, first captain of Carlton, and Charles Forrester, later a vice president of the Melbourne Cricket Club, transferred to Melbourne. Sources. The Carlton Story. Hugh Buggy and Harry Bell . Pages 15,16,17,259. The Argus newspaper 1868 & September 22 1890 editions. The Leader newspaper 1868 editions. 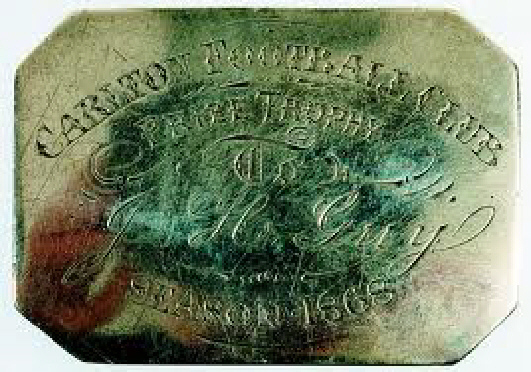 Centenary Souvenir of the Carlton Football Club. Page last modified on Wednesday 25 of July, 2018 21:07:02 AEST by blueycarlton.